I'm not sure about you, but when I imagined my professional life and home life as an adult, all I pictured was ease and comfort. Luckily for me, God cleared up that fantasy real quick, but it hasn't been nearly as horrible to live uncomfortably as you would think! In my dreams, I was a graphic design professional bringing in a decent salary every year and wearing adorable clothes all the time. Oh and we were going to pay off our mountain of student loan debt in 2-3 years flat. We'd spend a little time here in Maryland and then journey back to Texas where our family is living, then settle down. In my reality, I was blown off by the first company that said they had hired me, I spent the greater part of my first year here unemployed, and most of my second barely employed while volunteering my skills at Severn Run. Money wasn't great, my wardrobe did not improve, and 3 years later we are finally starting to put some money in savings while gradually chiseling down that mountain of student loan debt. Here's the stupid part: I wouldn't trade my reality for my dreams. I would pick this God-given reality over my fabricated lifestyle every time. Every. Stinking. Time. Which is really ridiculous when you start thinking about it. The amazing part about having the privilege to learn this amazing God-truth so early in my life is now I'm prepared to be uncomfortable for the rest of my life! Now I'm not talking about always being financially uncomfortable, I really do believe that God has always taken care of us, and now that I know I'm a better steward of my funds, I've already seen him bless in neat ways. I'm pretty sure discomfort will manifest in different ways all the time, but here are a couple experiences that have already come around in my role as Brand & Communications Director at Severn Run. Man, this one is the worst for an introverted lady like me. I went a full year at Severn Run without being introduced to our congregation, and I secretly loved it. For a full 52 weeks, I flew under the radar, did what needed to be done and then went home, and it was marvelous! Not long after that great year, it got out that I'm a pretty decent public speaker. The Creative Team knew this the whole time, but I don't know how the pastoral crew found out. It was probably all of that profound wisdom I kept dropping in Sunday planning meetings. Oh well. During one of these great meetings that last all of a Tuesday morning, my lead pastor, Drew Shofner, asked if I was ready yet to do the welcome time in our services. The idea had been tossed around before, so I had been wrestling with it for a while; this time I said yes and there it was, the spotlight, glaring in my face. That Sunday I introduced myself from stage, welcomed our guests, and shared one key thing happening at Severn Run that week, and then as I was walking back in to our Atrium I heard it, "Hey, did you hear? That girl right there is our new communications person!" Dang. I've been speaking from stage (and now I'm featured on our video announcements) on an almost weekly basis for a solid 6 months now and I'm still not used to feeling so relatable to complete and total strangers. Sunday afternoons are comprised of naps, chocolate, and silence in my house because Sunday Mornings are incredibly draining for me now. Aka - uncomfortable. So why do I do it? Well it's simple. God is calling me to this, even though my introverted cells hate it so much. It's really amazing to see how God has really equipped you for his calling when you just shut up and follow it. I receive so much positive feedback on how my offering prayers touched someone, or how my goofy presence on The Rundown brightened their day. Never in 1 million years would I have guessed I would be making a difference in this way. I've always been a stagehand hanging out behind the scenes, not BEING the scene. Ew, I still hate typing it a little. So why do I think it's my calling? Whenever I say that I'm following my calling in this way, The Voices (it's a reference to a sermon series, click it, I'm not nuts) try to tell me that I'm being really cocky. But once I shut that down, I'm confident in my calling because of the seeking I've done. At Severn Run, the millennial generation & women were severely underrepresented in the public eye. My stage presence has totally shifted that, and I'm hoping to see women and Millennials step up in big ways at Severn Run as a result. This one is really new. We finally started planning for Christmas 2 weeks ago. We set aside some time to get together and talk through what our Christmas season was going to look like at Severn Run, and off the record my Executive Pastor had asked me to make a plan and lead the meeting. I floored my lead pastor with how we got organized and he even kept me after we closed to let me know that he was appreciative of my leadership and impressed by my mad organizational skills (not a direct quote, but pretty close). Well I hope that my scattered stories can help you see that God calls us out of our comfort-zones more often than he calls us into them. If you are feeling a tug towards something and rationalizing your way out of it because it's not something you feel comfortable with...maybe it's time to reconsider. I don't believe that God calls us to things he hasn't already gifted us to do, the thing is you may not yet realize that you have that particular gifting! 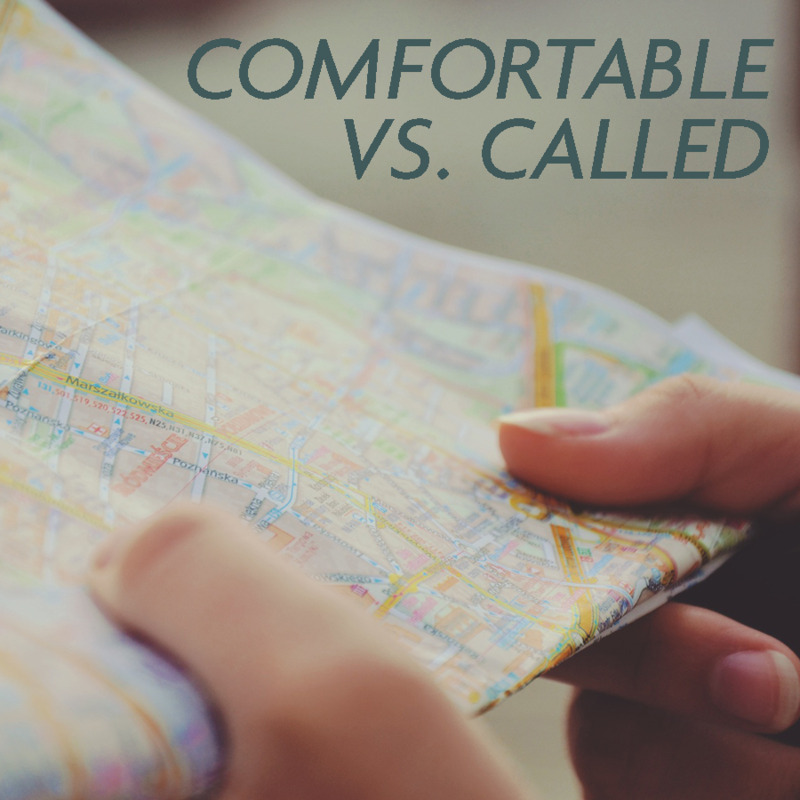 I know that the church would be in a better place than it is now if we followed God's calling out of our comfort-zones more often. How are you being called? Are you ignoring it? Are you listening for it? Maybe it's time to follow the call and allow yourself to be over-awed by how God uses you! Not sure how to hear your calling? You're in luck, Severn Run did a great series on hearing God's voice over the noise recently. Check out "The Voices" below.